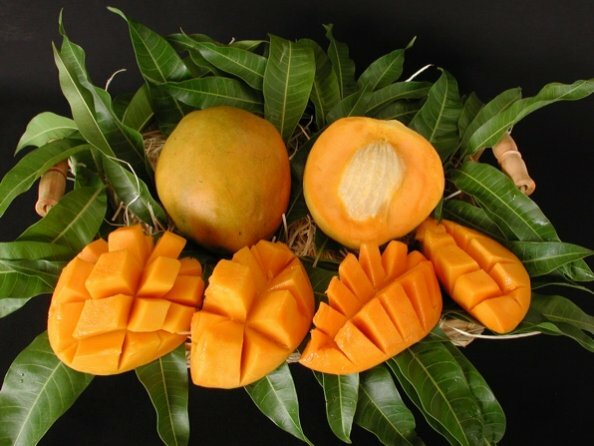 &QUOT;GRAHAM&QUOT; IS ANOTHER &QUOT;CONDO MANGO,&QUOT; AND IT WAS INTRODUCED TO FLORIDA FROM TRINIDAD. THE FLESH IS GOLDEN YELLOW, VIRTUALLY FIBERLESS, AND ESPECIALLY AROMATIC. THIS LONG TIME JAMAICAN FAVORITE IS BECOMING EXTREMELY POPULAR WITH FLORIDIAN HOMEOWNERS WHO HAVE SPACE CONSTRAINTS. THE TREE CAN BE MAINTAINED AT JUST TEN FEET, AND IT WILL REMAIN A GENEROUS BEARER. THE FRUIT RIPENS FROM LATE JUNE TO EARLY AUGUST.